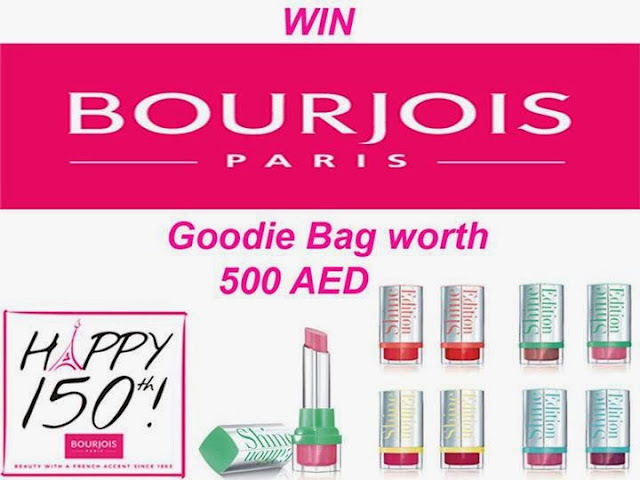 Home / Giveaway / Bourjois Goodie Bag Giveaway!!! I'll be choosing THREE winners randomly and they will be getting Bourjois Goody Bag Worth 500 AED containing Bourjois NEW Happy Collection and other latest products. How exciting is that?? The winner will be chosen randomly via random.org. Giveaway end on 14th Nov, 2013. 45 comments on "Bourjois Goodie Bag Giveaway!!!" love this giveawy! i have not even tried the bourjois shine lipstick edition. super excited! Thank you for this giveaway! its awesome and your work is great! is it open for pakistani's ? I like Sana's blog and the way she communicates to her subscribers - it's always soft and polite and makes just a perfect blogger for followers who want to enjoy reading about beauty! love bourjois cosmetics and thank u for this amazing giveaway! great giveaway and hope to win! What is gfc publicly ? ?